—Waypoint LATID, seen as referenced to Bangalore International Airport’s VOR (BIA). The basic airway system (in India and the world over) was constructed based on sensors: the VOR and the NDB stations and receivers on board the airplane, which provide the capability to fly to, or from a radio station along one of its “radials". These radio stations are scattered, purposely, across the country, and the airway system is constructed by simply “connecting the dots", and an aircraft’s position is always relative to one of these stations. 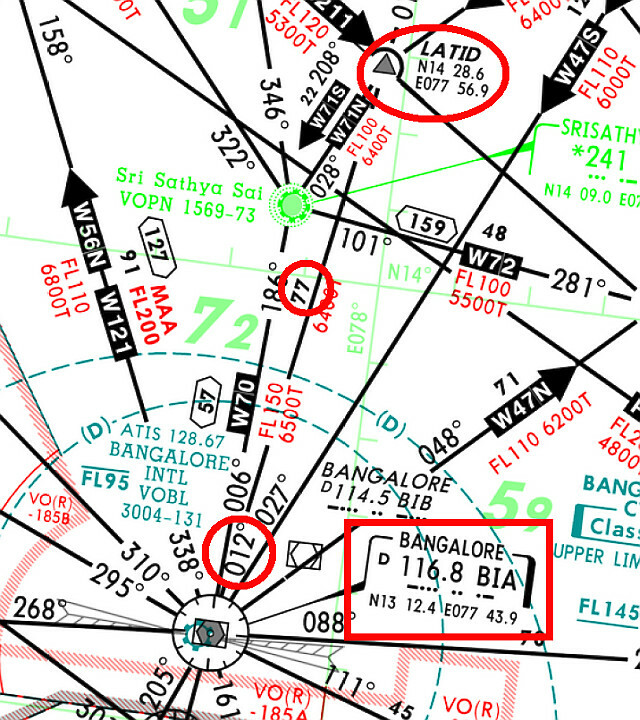 Example: Waypoint LATID is 77NM from Bangalore International Airport’s VOR (BIA), on a radial of 012°of BIA. The advantage with absolute position is freedom in the lateral: an aircraft can determine its absolute position, and fly to another waypoint whose absolute position is known, without having to stick to a “radial" or a VOR station. The ability to fly “Direct-To" another waypoint from the present position offers an easily comprehendible advantage: fuel savings through shorter, more direct routes. This freedom in the lateral, and the ability to navigate freely in an area, gives rise to RNAV, or Area Navigation. Indian airspace is comprised mostly of “W" routes, which are, as per AAI, exclusively available for domestic operators only. According to ICAO Annex 11, a “W" route is NOT an Area Navigation Route, which means, the airway is constructed with reference to ground radio beacons, and are mostly direct from one beacon to another. The other airways in India are “A", “B", “G", “L", “M", “N", “P", “Q", “R", “UL", “UM". Of these, “L", “M", “N", “P" and “Q" are area navigation routes. This means that these routes are not constrained to fly between ground based radio stations, but are instead optimised, more direct routes that save fuel. The “Q" routes were recently introduced in 2012, in July. Certain routes, and certain procedures may require a higher navigation accuracy and its associated certainty, while others may be less demanding. To quantify these “higher and lesser" accuracies, the term “Required Navigation Performance" (RNP) was introduced, which stipulates the minimum navigational accuracy that must be guaranteed, with a certainty of 95% availability. The Area Navigation Routes – “L", “M", “N", “P" – are all RNP 10 in India. The newly introduced “Q" routes, are all RNP 5. This means that your aircraft’s navigation accuracy must be better than 5 NM if it is to fly along the newly introduced 7 “Q" routes: Q1 – Q7. If however the ANP of the aircraft is 5.5 NM, then the accuracy is not enough to fly the “Q" routes, but accurate enough to fly thee RNP 10 routes: “L", “M", “N", “P". The benefits of the RNP routes are evident. The newly introduced “Q" routes connect Delhi to Mumbai, Ahmedabad, Udaipur, and Vadodra. Picking “Q1", which is Mumbai to Delhi (BBB- DPN), there are 13 waypoints in between the starting (BBB) VOR and the ending (DPN) VOR. Except for one, none of the other waypoints are ground based radio aids. The total ground distance between Mumbai and Delhi along Q1 is 633NM. 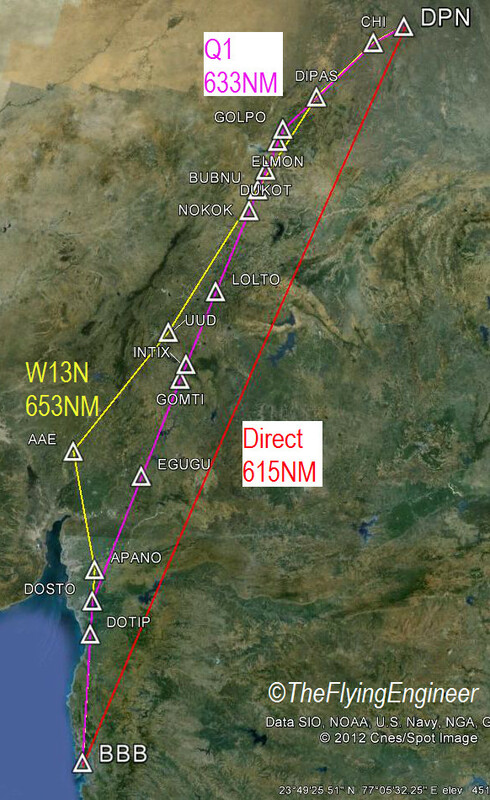 The domestic non-RNAV “W13N" route between Mumbai and Delhi, has 5 waypoints in between, three of which are ground based radio aids (VOR). The ground distance along W13N is 653NM. A347, another non-RNAV route between Mumbai and Delhi, has 9 waypoints in between, three of which are ground based radio aids. The ground distance along A347 is 735NM. Compared to W13N and A347, Q1 saves 20NM and 102NM of ground distance, which translates to a saving of between 2 minutes and 14 minutes of flying time. A heavy Airbus A320, flying at FL350 at 76Tonnes, can save between 124 kg and 634 kg of fuel, which translates to a saving of between INR 11,000 and INR 56,227 per Mumbai-Delhi flight. Another advantage is the smooth flight path, as opposed to the zig-zag of non-RNAV routes. Aircraft with high navigation performance are allowed to fly the RNP routes. With higher accuracy, more airplanes can be squeezed on an airway. The “Q" routes allow aircraft to aircraft longitudinal separation of 50NM, while W13N allowed for a 10 minute separation, which translates to around 75NM. Theoretically, up to 13 airplanes may now fly on Q1, at any point of time, as compared to 9 on W13N. The capacity of the Indian Air Traffic System (ATS) has increased 44% on this route alone. It’s indeed a very good article regarding PBN, RNP and RNAV. Very much informative. very informative vasuki. keep up the good work! thank you for the article, its helped me understand RNP better. please do write more such articles concerning airways/airspace in India. For which airfield do you wish to tailor your approach? we, to70 GmbH are able to do construct as well as to check your proposal. Could you share what places the other 6Q- RNP 5 routes connect? What is the requirement of having so many waypoints on the Q route, and that some of them are just 2 nm apart? Hi Shiv, Is that you? Very informative !! Thank you. I was really searching for such an article on Indian Air navigation and routes. Capsuled to touch and relate all useful info. Wonderfully explained! I have been looking for the width of these airways and from what I have found , the L,M,N,P are all 20NM wide(10 each side). But there’s nothing mentioned about Q routes . Are we supposed to assume their width according to the accuracy required i.e. 5nm? Brilliant article sir! Explained very well!